In 2016, the state of Paraná was hit by heavy rain, which caused traffic disruption on some highways and bridges. 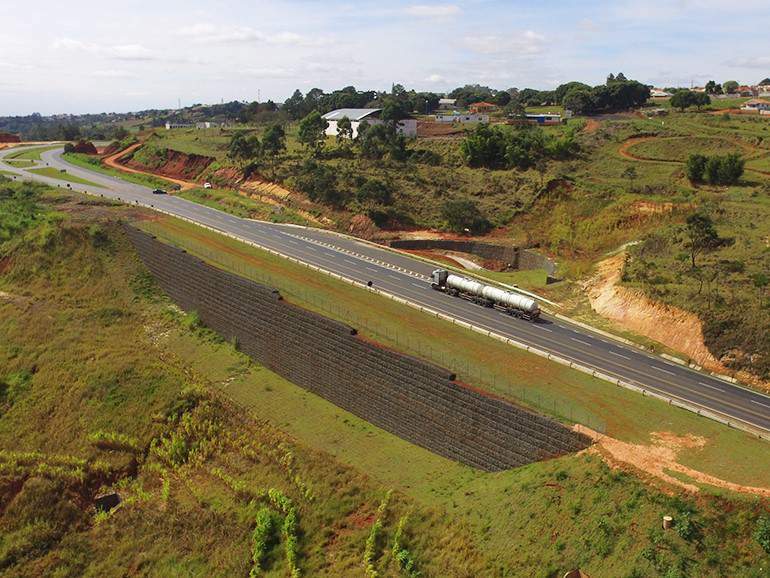 One of the major problems affected the PR-092 highway, which gives access to the Norte Pioneiro region of Paraná and to the State of Sao Paulo. The stretch at km 251, close to the municipality of Wenceslau Braz, collapsed due to a landslide. This is a strategic road link, whose benefits reach over 100 thousand residents living in the nearby cities. All the agricultural and industrial production of the region is drained by the highway. The Paraná Road Department (DER) needed an emergency solution to rapidly reconstruct this vital highway stretch and the collapsed slope. At the same time, they wanted a definitive solution, to protect against future landslide hazards and ensure road safety. a hydraulic structure addressing the issue of water erosion. Our Terramesh® System is a modular system used to form rock faced Mechanically Stabilised Earth walls. It has been used globally on some of the most significant infrastructure schemes, including what is believed to be the tallest reinforced soil structure in the world at 74m high. It consists of pre-assembled units of double twisted wire mesh (8×10 type). The facing section of the unit is formed by connecting a back panel and diaphragms to the main fascia unit, thus creating the rectangular shaped cells used for stone confinement. The geogrid reinforcement, fascia and lid are all one continuous panel of mesh. On this slope, it was used in conjunction with our MacGrid® WG high performance primary geogrids. The project also included the construction of a hydraulic drainage structure composed by a parabolic shaped gabion wall to contain erosion above the highway; a tubular concrete culvert, 1.2 m in diameter and 100 m long, which is perpendicular to the highway; and a dissipation structure at culvert outlet. This solution will effectively protect slope and highway from future heavy rainfalls. According to the newspaper Tribuna do Vale, the Government of Paraná invested about R $ 9 million in the project. For more information on our Slope Reinforcement solutions, please contact us.